General comments: A popular place in the heart of Rusholme, which is worth visiting, if only for the sight of the sizzlers, as confirmed by some of the comments below. It was originally quite strong and marked as 4/5, but it has suffered in comparison over the years as newer, and generally better, establishments have opened up in the centre of Manchester, despite a refurbishment (although not of the ladies' toilets, it seems). The revenue was good [presume you meant venue, but have left in case you have a handle on their finances], nicely kitted out, I arrived early so loitered outside looking at the menu but that didn’t last as the host came out and ushered me inside, sat me down and got me a beer... I quickly ran out of lives crushing candy waiting for the others to arrive, but was joined by Ms Roe and then Mr C... before the tardy crowd eventually arrived.. refurbishment was … good but I have no “before” to compare to.. chairs were nice but had a seedy, violent underbelly... the music sounded like “one pound fiiiiish” on loop... and the waiter… looked like he needed to eat a few more curries himself as was way too thin.. [Oh god, one sentence again. It's just a stream of consciousness.] "
"Thanks for sorting. I thought it was just OK. I had the Tava Roll for my starter - a bit overcooked and in comparison to Mughli's way off the mark. My main was the Mushroom Bhaji - this was good, packed full of different types of mushrooms, spicy and tangy at the same time. Wan't impressed by the naan bread nor the service." "Thanks very much for organising, was a great night. And now to the all important review. Went for the "famous" sizzler! And it truly did sizzle! Tasted good too. Waiters kept the beer flowing. Slightly aggressive on pushing the drinks but there are worse things than having too much beer! Took a while to get round to the food though. Pretty good for the curry mile I'd say, would go back." "So I'm supposed to be revising, which of course means now is an excellent time to write a review of Al Bilal. 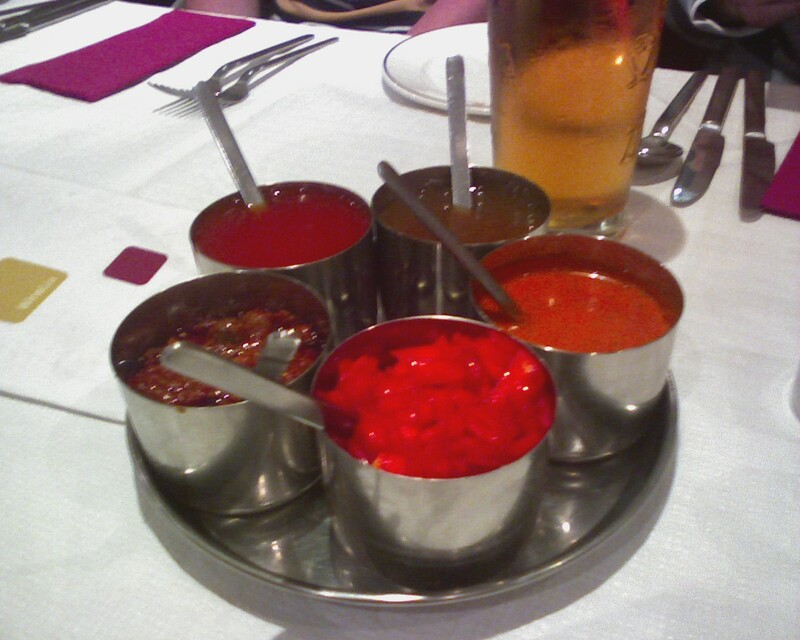 Another enjoyable Curry Night for me, and a return to the infamous Al Bilal. Sadly no sign of the crazy waiter but the staff who were present were very friendly and the service was good. I was slightly apprehensive as I remembered last time being slightly ropey, and not much has changed really. I've had much better curries elsewhere, but I enjoyed myself which says a lot for the power of good company (despite the absence of Brungerio). Onion bhaji to start, fairly good but took a while to materialise after we placed our order. Chicken karahi for main - actually quite disappointing. The pieces of chicken were small and dry and the sauce was a bit nothingy, felt like it could have been generic curry sauce from Wetherspoons (other high street chains are available). However, the naan was good and the large bottles of Tiger were plentiful. The sign outside has changed (as have the colour coordinated chairs and napkins inside), but the ladies toilets were a bit decrepit and the place as a whole felt a little unloved. Slightly worrying as this seems to reflect the terminal decline of Rusholme as a destination for excellent curry, although maybe I'm being slightly over-dramatic [well, put it this way, it had definitely had a refurb]. I particularly enjoyed the after school activity at the Albert, despite being appalling at silly pool. A fun Curry Night, long may the run of excellent form continue [three good nights on the trot, a run which started distinctly after Bollywood Masala]." "What can I say. Perhaps the most memorable curry experience I have ever had. In my 25 years [cough] or so of going to curry houses I have always previously considered ordering my food to be a necessary but purely functional part of the evening. This is the first time it has ever been a highlight. Theatrical, comical, slightly scary and just a little bit too camp to be comfortable. I don't know where they have been hiding that waiter but he will undoubtedly become part of curry night folklore. In 10 years' time people will say "do you remember the waiter in Al Bilal" and those of us who were there will give a nod and a knowing smile. In response to the question "which one is Al Bilal" no longer will people reply "it's the one with sizzlers and pints cider on draft" but instead they will say "it's the one with the camp waiter". Wonderful." "The waiter was scary - it was probably okay if you were further down the table but I was a bit close for my liking. Puri was good - lots of prawns although it was quite large and almost a meal in itself. The sizzler was also good. I actually felt I'd had a vaguely healthy meal afterwards and wasn't really stuffed. However, they got the sauce I had ordered wrong - although this didn't really both me as I wasn't planning to have it anyway! A good night out but not somewhere I would make the trek [er, your boyfriend was your chauffeur...] down to Rusholme for regularly." "The decor and welcome were fairly standard Rusholme (other than a photocopied sign proclaiming the restaurant to be the favourite of the doctor off GMTV, and a framed t-shirt with a joke about farts on it), which lulled us into a false sense of security before the arrival of the Wacky Waiter - imagine if Graham Norton and John Inman (before he was dead [worth clarifying, one feels]) had a son, who was somehow Indian. He was good entertainment, but there was no end in sight to his zany antics. He also said something weird at some point, trying to excuse the fact that the food was canny late, which didn't help [he referred to the food being freshly cooked from scratch, but perhaps it was just that they were understaffed in the kitchen]. He did refer to spaceman as the Mentor of the Naans, though, which is a name that will surely stick [you'd think - not heard it since, though]. The chicken tikka starter did a job - maybe slightly dry. More generous servings of lemon would have helped [odd]. My main - a lamb Karahi - was extremely nice. I fancied a change from recent spinach overdoses, and was rewarded with a dish I would definitely recommend. Served at the right temperature (let the spice do the work), and without the presence of iceberg like meat giants resting below the surface. The sauce was excellent, although when it first got the back of my throat I thought it was going to do me an injury, but initial shock aside it tasted good, and never overwhelmed. Even the inevitable taste lingering the next morning was actually good - I'd have considered a return for elevensies [a kindergarten version of elevenses, perhaps]. At first the naans were ropey in their paucity of garlic, but it turned out they were just a bit subtle - good marks there too. Slow, but quality, like Henrik Larsson. Except mad. Giving it a score out of 5, I would say it was well weapon." "The food wasn't memorable, but who cares?! The waiter was absolutely superb - it was a such an over-the-top camp performance, even out-bantering space "guardian of the naans" man [ok, sometimes you just gotta let 'em flow]. The prices were the same as in town but the quality of the food was no where near as good, but I didn't care too much as I had been thoroughly entertained!" "My tandoori mixed grill was very tasty - and ever more importantly I could identify the pieces of meat [always a bonus] and it came in a large portion. Only gripe was that I asked for a medium sauce but it was very mild." "Well I suggested it, so obviously I've got to say it was good. But I actually thought it was. Pints of cider on draft and a chicken tikka sizzling special with masala sauce. What more can I say! [Evidently not a lot.]" "One of the best curry places in Rusholme - pints of cider (a rarity in Rusholme) and great sizzling dishes." "My sizzler thing was yummy. Lots of nice veg and meat, then a sauce of your choice. What a good idea! And they had Grolsch on tap! That was the best bit..."